On Monday, we got another release to Museum Mile store. The collection consisted of some nice, trendy and what seemed popular items. The most wanted item was definitely the white dress in the middle of a pic above, leaving many members disappointed as they did not get a chance to get it in time, as the collection was limited. I managed to get it in time, I even got one dress with an id number 1/1000 which was really interesting. I bought some stuff I regret now, (mostly interior which I never use), and I do plan on selling some when they become visible in my bazaar. The other 2 dresses on the pic next to the white dress, are really nice too, I even prefer the one on the top right instead of white dress. I prefer those kind of releases, as the prices are fair, and we still get fairly limited stuff. Compared to other limited collections. On Wednesday we got another Callie's Picks collection, this time themed and named "Print Perfect". The collection is better than the previous one, that's a fact. It also has some rarer items, and the most popular and valuable item (well at least it used to be, not anymore) - DFV black bow. I don't get what's so special about the bow, but yet people were selling it for a 600sd. Again, if you paid for the item and it gets re-released, you are taking that risk when clicking the 'buy' button in someones bazaar, as anything except limited stuff can get re-released. Items like these, in my opinion, seem kinda hard to mix and match and combine, and I will probably just buy the bow. On Thursday, another release, this time to Epiphany store. One more time, the collection seems to be inspired by newest Callie's Picks collection, with a variety of colors and shapes. Really, really interesting and kinda different collection. There is so much detail, and colors work well together fantastically. The problem for some users is that the items go to our beauty parlor instead of suite. While some of them have different outfits in different rooms, and the jewelry can be miss matching sometimes, think like this: If they went to our suites, they would look too small, go over our hair, and easy to be lost in rooms. Anyone agrees? And as a cherry on a top of, well, okay week - July HotBuys got announced, Thursday as well. 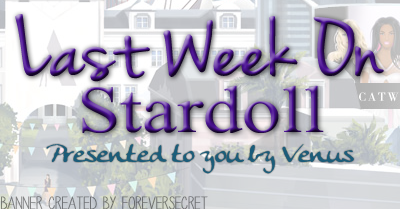 - Fendi Tribute - Stardoll continues with their Monday Tribute store releases. - New Stardesign hair studio - nice, but why so much stuff for curly hair? - 'Summer Heat' - probably a new gift-o-meter or new offer - anyway, save your money! So that concludes this week, hope you liked it and are looking forward to a following one. Until then, vote, comment, and see you next week.